The first (and perhaps most surprising) region that promises a shift to liberal democracy is a cluster along Africa’s Mediterranean coast: Morocco, Algeria, Tunisia, Libya, and Egypt, none of which has experienced democracy in the recent past. The other area is in South America: Ecuador, Colombia, and Venezuela, each of which attained liberal democracy demographically “early” but was unable to sustain it. Interpreting these forecasts conservatively, we can expect there will be one, maybe two, in each group that will become stable democracies by 2020. I read that article when it was published, and I recall being irritated by it. At the time, I had been studying democratization for more than 15 years and was building statistical models to forecast transitions to and from democracy as part of my paying job. Seen through those goggles, Cincotta’s construct struck me as simplistic to the point of naiveté. Democratization is a hard theoretical problem. States have arrived at and departed from democracy by many different pathways, so how could what amounts to a one-variable model possibly have anything useful to say about it? Revisiting Cincotta’s work in 2014, I like it a lot more for a couple of reasons. First, I like the work better now because I have come to see it as an elegant representation of a larger idea. As Cincotta argues in that Foreign Policy article and another piece he published around the same time, demographic structure is one component of a much broader and more complex syndrome in which demography is both effect and cause. Changes in fertility rates, and through them age structure, are strongly shaped by other social changes like education and urbanization, which are correlated with, but hardly determined by, increases in national wealth. Of course, that syndrome is what we conventionally call “development,” and the pattern Cincotta observes has a strong affinity with modernization theory. Cincotta’s innovation was to move the focus away from wealth, which has turned out to be unreliable as a driver and thus as a proxy for development in a larger sense, to demographic structure, which is arguably a more sensitive indicator of it. As I see it now, what we now call development is part of a “state shift” occurring in human society at the global level that drives and is reinforced by long-term trends in democratization and violent conflict. As in any complex system, though, the visible consequences of that state shift aren’t evenly distributed. In this sense, Cincotta’s argument is similar to one I often find myself making about the value of using infant mortality rates instead of GDP per capita as a powerful summary measure in models of a country’s susceptibility to insurgency and civil war. The idea isn’t that dead children motivate people to attack their governments, although that may be one part of the story. Instead, the idea is that infant mortality usefully summarizes a number of other things that are all related to conflict risk. Among those things are the national wealth we can observe directly (if imperfectly) with GDP, but also the distribution of that wealth and the state’s will and ability to deliver basic social services to its citizens. Seen through this lens, higher-than-average infant mortality helps us identify states suffering from a broader syndrome that renders them especially susceptible to violent conflict. Second, I have also come to appreciate more what Cincotta was and is doing because I respect his willingness to apply his model to generate and publish probabilistic forecasts in real time. In professional and practical terms, that’s not always easy for scholars to do, but doing it long enough to generate a real track record can yield valuable scientific dividends. Today’s New York Times includes a feature article that spotlights two major weak points in China’s massive government-led urbanization scheme. The first is the presumption that state planners can manufacture a social transformation that occurred more organically in the societies those planners are trying to emulate—and on an unprecedented scale, too. As Jane Jacobs could have told them, urbanization isn’t just about moving people into cities or sprucing up the cities they’re in. How those spaces grow, how they fit into the larger economy, and how people feel about being there turn out to matter, too. The situation in these new towns contrasts with the makeshift housing where other migrants live. Many of those are created by farmers who chose to leave their land for jobs in the city. Although cramped and messy, they are full of vitality and upward mobility, said Biao Xiang, a social anthropologist at Oxford University who has studied migrant communities. The new homes have cracked walls, leaking windows and elevators with rusted out floors. For farmers who were asked to surrender their ancestral lands for an apartment, the deterioration adds to a sense of having been cheated. There was a lot of corruption, and they skimped on materials. The nexus of authoritarian government and corruption, and the sloppy construction it produces, was the central theme of a talk I gave at TEDx Tbilisi earlier this year, called “Why dictators build things that crumble.” As I said in the talk, authoritarian regimes often do shoddy building—even on projects that are politically and economically important to them—because those things aren’t just built to keep citizens happy. They are also built to keep the dictators’ important friends in the construction and real estate and banking businesses happy, and those friends aren’t always so interested in making sure that the things they build actually work. Reading this article, I wondered again if the Communist Party of China has set its society up for failures of infrastructure on an unprecedented scale, and what the socioeconomic and political consequences of those failures might be. For many social scientists, the word “development” conjures images a specific bundle of socioeconomic and political transformations: rural to urban, farms to factories, illiterate to literate, poor to middle class, lawless to lawful, despotic to democratic, insecure to secure, even sad to happy. Many of us see these changes as not just interrelated but interdependent, a beneficent syndrome of social improvement. Equally important, we often think of states as the engines of them. A few things I’ve read in the past few weeks have vividly reminded me how much this idea of ordered, collinear, policy-driven development misses the mark. The urbanization part remains quite real, and economic growth is shrinking the share of the world’s population that lives in absolute poverty. Importantly, though, the social orders that produce these changes often lie outside the state. These orders fall within the territorial boundaries we plot on our political maps, and they are affected by the actions of domestic and foreign governments, but policy choices and the beneficence of external actors seem to have very little to do with the massive transformations afoot in many of these places. Men in patched overalls and women in freshly washed blouses walk down a narrow lane just after six in the morning. They are packed in tightly like spectators leaving a sports stadium, but this is their life, their every morning. Backs are straight; trousers and sleeves rolled up, exposing mottled yet able limbs. They crush discarded wrappers of quick-fry breakfasts under foot, corn and oil dripping from mouths. Banana skins are ground to dust by thousands of feet. Everyone is moving in one direction, jostling and shoving, out of a maze of low-strung shacks, past shops selling shoes and phones that have already been open an hour, out into the high-rise centre of Nairobi, where factories and offices pay salaries. Kibera is an African version of a Chinese boomtown, an advertisement for solid human ambition. Like Guangzhou and Xiamen, it acts as a magnet for talent from rural areas, attracting the most determined among young farmers. To equate slums with idleness and misery is to misunderstand them. Two out of three Nairobians live in one, half of them in Kibera. Officials occasionally try to evict squatter-residents but many fight back, with the help of Muungano wa Wanavijiji, their own lobby group…Slums are far from hopeless places; many are not where economic losers end up, but rather reservoirs of tomorrow’s winners. The same themes appear in Behind the Beautiful Forevers, Katherine Boo’s award-winning book on life in Annawadi, a shantytown next to Mumbai’s international airport. The families that Boo follows routinely suffer things that I can’t imagine tolerating for a day—roach swarms in their kitchens, rat bites while they sleep, lice, putrid water, foot fungus so large it’s described in three dimensions, and, of course, omnipresent hunger—but most of them just keep getting up and trying again. The state does seem to reach into Annawadi more than in Kibera, but that reach is often exploitative rather than supportive. Police officers solicit bribes to ignore the extra-legal activities on which many residents’ livelihoods depend, bureaucrats set up sham schools in the slums to extract payments from international charities and state governments, and local officials extract blocs of votes in exchange for small favors. “The big people think that because we are poor we don’t understand much,” she said to her children. Asha understood plenty. She was a chit in a national game of make-believe, in which many of India’s oldest problems—poverty, disease, illiteracy, child labor—were being aggressively addressed. Meanwhile the other old problems, corruption and exploitation of the weak by the less weak, continued with minimal interference. These off-the-regression-line amalgamations of statelessness and order, of poverty and hustle, of corruption and opportunity also show up in Caracas, Venezuela, in a recent New Yorker piece by Jon Lee Anderson. Anderson gives us a first-person account of life in scores of buildings in the Venezuelan capital that have been occupied in the past 10 years by squatters known as invasores. One of those buildings is the Tower of David, an unfinished residential skyscraper that was one of the first structures the squatters claimed, and Anderson toured the Tower with its current boss, an ex-criminal named Alexander Daza. As we went along, Daza explained how the building worked. He had a rhythmic, emphatic way of speaking, like a preacher. “There’s no prison regime imposed here,” he said. “What there is here is order. And there are no cells here, but homes. Nobody is forced to collaborate here. No one here is a tenant but an inhabitant.” Each inhabitant had to pay a monthly fee of a hundred fifty bolivares (about eight dollars at the black-market exchange rate) to help cover basic maintenance costs, such as the salaries of the cleanup brigade and the work crew. People who couldn’t afford to build their dwellings were given financial assistance. The residents were all registered, and every floor had its own representative delegate to attend to problems. If problems couldn’t be solved at the floor level, they were taken to a Tower council meeting, which Daza led twice a week. A common problem, he said sourly, was residents’ not paying their monthly quota, and it was hard to dissuade tenants from flinging their trash into the courtyard. Transgressors, he said, “are given a warning to appeal to their conscience.” There was a disciplinary board, and serial offenders could be kicked out of the building, but there were always those who took liberties. Like Kibera and Annawati, the occupied towers and warehouses Anderson describes are, in a manner of speaking, being governed, but their bosses are neither elected nor appointed by anyone in the chain of command recognized by the international system. “It appeared that the government did not officially approve of the Tower of David invasion,” we’re told, “but it had made no attempt to close it down.” It’s also clear that violence plays a more important role in producing the political order Daza described than his rosy narrative of a self-sustaining democracy let on. I don’t mean to romanticize the violence and poverty and fear suffered in these places, or to suggest that states and policy and aid are irrelevant to political and economic change. These slums certainly aren’t libertarian utopias, and most of the residents we encounter in these reporters’ stories regularly imagine their escapes to richer neighborhoods under government writ. If we use the appearance of the first tools as our starting point, it took about 2,485,000 years, or 99.4 percent, of our economic history to go from the first tools to the hunter-gatherer level of economic and social sophistication… The economic journey between the hunter-gatherer world and the modern world was also very slow over most of the 15,000-year period, and then progress exploded in the last 250 years… To summarize 2.5 million years of economic history in brief: for a very, very, very long time not much happened; then all of a sudden, all hell broke loose. People sometimes do not realize how total has been the normative triumph of some of the ideas typically associated with democracy, even if one thinks that democracy itself has not succeeded quite as spectacularly. Take, for instance, the norm that rulers of states should be selected through some process that involves voting by all adults in society (I’m being deliberately vague here) rather than, say, inheriting their position by succeeding their fathers. In 1788 there were only a couple of countries in the world that could even claim to publicly recognize something remotely like this norm. Most people could not vote, and voting was not generally recognized as something that needed to happen before rulers could rule; rulers could and did claim to have authority to rule on other grounds. Norms of hereditary selection structured the symbolic universe in which political competition took place, and defined its ultimate boundaries for most people (at least those who lived in state spaces). Yet by 2008 there were only four or five countries in the world that did not publicly acknowledge universal voting rights. If you consider the timing, pace, and character of those two trends side by side, it’s very hard to believe that they aren’t interrelated. Take a look at this figure below. 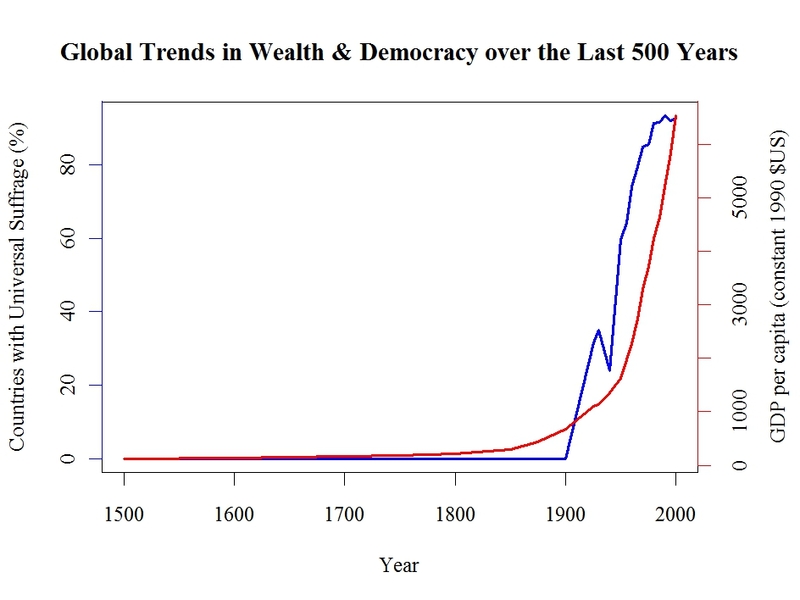 The red line replicates a portion of Beinhocker’s aforementioned plot, using world GDP estimates produced by economist Brad De Long (PDF) to show the exponential growth in human wealth over the past 200 years. The blue line plots the spread of universal suffrage across states in the international political system, as recorded in the Political Institutions and Political Events (PIPE) data set Marquez used in his blog post. I do not read this chart as evidence in favor of modernization theory, which posits a causal arrow running from economic development to democracy and envisions that changes within specific nation-states unfold in a particular sequence: industrialization –> urbanization + education –> value changes –> democratization. In fact, the chart of long-term global trends masks lots of short-term churn in the status of specific countries and regions. Many countries have diverged sharply from the developmental sequence posited by modernization theory, and that’s a serious problem for a theory of change. Democracy has unique benefits as a form of collective problem solving in that it potentially allows people with highly diverse perspectives to come together in order collectively to solve problems. Democracy can do this better than either markets and hierarchies, because it brings these diverse perceptions into direct contact with each other, allowing forms of learning that are unlikely either through the price mechanism of markets or the hierarchical arrangements of bureaucracy. Furthermore, democracy can, by experimenting, take advantage of novel forms of collective cognition that are facilitated by new media. One point I would like to amplify in this line of thinking is that democracy isn’t really a specific “thing” so much as the label we stick on a cluster of seemingly similar things. Like human “races,” political regime types are a set of concepts we’ve developed to organize our thinking about similarities and differences in forms of the social technology we call government. These concepts are neither natural nor inevitable, and they often obscure a tremendous diversity within the categories they establish. Our decision to classify something as a “democracy” depends on many different features, each of which can take a wide variety of forms without violating our mental classification scheme. On electoral systems alone, you’ll be hard pressed to find two cases that look exactly alike, and that’s just one of many relevant attributes. And, of course, even in cases we might consider archetypal, these rules are constantly evolving. One practical implication of this point is the political version of Owen Barder’s advice to purveyors of foreign aid: instead of searching for “best practices” we can copy from one context and paste onto another, we should think about how to facilitate appropriate experimentation, feedback, and learning within societies we wish to assist, and about what kinds of changes we might make in our own rules and organizations that will further support those processes. These institutions are not modular, and we cannot control the systems in which they’re embedded. We don’t build states, we perturb them, and we should never lose sight of that difference. We read this trope about authoritarian states as tough but effective modernizers a lot, but the real story is more complicated. The same day Traub’s essay appeared in Foreign Policy, the New York Times ran a story about a 330-foot section of bridge in the Chinese city of Harbin that collapsed just nine months after it was built, killing three and injuring five. As the story notes, this was the sixth major bridge collapse in China in the past year, and the high-speed trains that seem to inspire so much envy abroad have suffered similar safety problems. We hear echoes of these stories from other dictatorships. In the 2000s, Angola was one of Africa’s fastest-growing economies, and a lot of people were stunned to hear not long ago that money is now flowing from Angola into its former colonizer, Portugal. In a New York Times op-ed on Wednesday, Rafael de Marques Moraes describes how that country’s oil-rich regime has spent hundreds of millions of dollars over the past decade on massive construction projects that have literally fallen apart not long after they were completed. The…roads, hospitals and schools began to crack as fast as they were being built. Luanda’s General Hospital had to be shut down in June 2010, when bricks started to fall from the walls, threatening it with imminent collapse. Newly tarred roads were washed away after one rainy season. If dictators are supposed to be so good at building things, why does so much of what they build fall apart? The explanation we often hear about the persistence of authoritarian rule in China or Angola or Russia or any number of other non-democratic regimes focuses on the relationship between rulers and citizens at large. Modernization theory leads us to expect countries to become more democratic as their economies grow and their societies become wealthier, more urbanized, and better educated, but, as China shows, that doesn’t always happen. So, in a kind of addendum to modernization theory, we’re told that these transitions have been forestalled by an implicit social contract between rulers and subjects. The regime supplies an improving standard of living and the infrastructure on which it hangs, and citizens stay quiet in return. Instead of producing the predicted pressures to reform, economic growth conveys “performance legitimacy” on the authoritarian rulers who oversee it, at least temporarily, and the transition to democracy is deferred until the economy slumps and that bargain comes undone. If performance legitimacy is the pillar on which authoritarian rule depends, then these collapsing bridges and melting roads are major screw-ups, and they really shouldn’t happen. In fact, performance legitimacy could be part of what keeps authoritarian regimes alive, but it’s certainly not the whole story. As Bueno de Mesquita, Smith, Siverson, and Morrow highlight in their work on the logic of political survival, another and arguably more important set of exchanges is routinely occurring between political leaders and the smaller circle of military, business, and social elites on whom their rule more directly depends. In this version of the world, it turns out that massive infrastructure projects are not just about supplying public goods to keep citizens happy. They are also—maybe mostly—about giving cronies ways to launder big loans that are really more like political payoffs than social spending. By spending large portions of those loans on improving real estate they’ve often seized from hapless citizens, the cronies get to inflate the value of their assets while distributing shares of the loot to a bunch of people on whose support their influence depends. If authoritarian rulers were serious about upholding a social contract with their citizens, they would write strong building codes and establish effective inspection regimes that would protect these big investments. But they don’t. Instead of trying to make their citizens happy, dictators spend their money on monitoring and repression meant to keep angry citizens down. They aren’t benevolent but brutal modernizers constructing a better future for their grateful subjects; they’re mafia bosses oiling the machinery that keeps them alive and well fed. These guys aren’t investing in public well-being; they’re investing in political loyalty. In democracies, where journalists can snoop around, bureaucrats can blow whistles, and politicians can routinely lose their jobs if most voters don’t like what they’re doing, elected officials have stronger incentives to supply public goods, and that includes things like making sure the infrastructure they build doesn’t fail. In this environment, you’re more likely to hear stories like this one from my home state a few days ago, where a major commuting artery was shut down for a day because workers saw unusual movement in a bridge span and state inspectors needed time to check it out. From this perspective, it’s easier to see that the absence of mass mobilization in these regimes owes more to the challenges of organizing collective action under the thumb of a powerfully repressive regime than to any lack of motivation. China has reportedly experienced tens of thousands of protests and riots each year for years, and anti-government demonstrations have recently swelled in Angola as well. Clearly, not everyone’s signing on to this supposed social contract. The fact is, these regimes survive in spite of all this unrest, not because unrest is absent. The major barrier to change isn’t citizen satisfaction. Instead, it’s the repressive state that makes it extremely difficult for frustrated citizens to transform all of those atomized events into the kind of broad and sustained movement it takes to push a deeply entrenched set of elites off of their well-defended perches. A few weeks ago, the blog ABC Democracy posted a video of Adam Przeworski speaking at a Kenyon College conference entitled “Should America Promote Democracy Abroad?” Przeworski is widely and justifiably considered one of the preeminent scholars on comparative democratization, so I was very curious to hear what he had to say on a topic that greatly interests me. It turned out that I agreed wholeheartedly with Przeworski on the conference’s titular topic, but I disagreed with a few assertions he made along the way about the state of our knowledge on transitions to and from democracy. I thought I would take advantage of my blogger’s platform to engage in a virtual dialogue with Przeworski on those issues and then close on some points of agreement. In spite of an enormous amount of research over the past 30 years, we don’t have a general understanding of why dictatorships fall. There are [sic] statistical work that introduces every possible factor you can imagine–not just the kitchen sink, the grandmother’s attic. And the results are, one, not robust, and, two, in statistical terms, have very weak predictive power. Which leads me, after many years of this kind of work, to believe that, in fact, dictatorships run many different, idiosyncratic risks and fall for idiosyncratic reasons. Przeworski is surely correct that there are many pathways to democracy, but that doesn’t mean we can’t use statistical models to forecast where and when democratic transitions will occur. In fact, we’ve got solid evidence that we can. In a report I wrote for my old job as research director for the Political Instability Task Force, I summarized the results of modeling exercise aimed explicitly at assessing the likelihood of transitions to and from democracy in countries worldwide since the early 1970s. As the report describes (pp. 22-24), a relatively simple statistical model discriminates fairly well between impending transitions and durable autocracies. In an out-of-sample forecasting exercise using a simple decision rule (Top 20), that model correctly flagged 26 of the 29 impending transitions (sensitivity of 90 percent) as “high-risk” cases while producing roughly nine false positives for each of those true positives (specificity of 73 percent). Those accuracy rates are far from perfect, but they’re also a lot better than chance, which is what I hear in Przeworski’s phrase “very weak predictive power.” The specific causes and catalysts of democratic transitions may vary widely over space and time, but there seem to be enough commonalities across recent cases that we can get a decent read on which ones are “ripest” for this kind of change. We do understand quite well conditions under which democracies survive…There is a fact, which you probably know because I know that some of you have read it, but which continues to be astonishing, which is that no democracy ever fell in a country with per capita income higher than that of Argentina in 1976. This fact may not be as, well, factual as Przeworski believes. As I noted in a recent post, using economist Angus Maddison’s estimates of GDP per capita, I can think of at least two breakdowns of democracy in countries richer than Argentina in 1976: Thailand in 2006, and now Hungary in 2011. To be fair to Przeworski, Thailand in 2006 was not much richer than Argentina in 1976–their per capita incomes were $8,238 and $7,965, respectively–and not everyone would agree that Hungary’s crossed the line into authoritarian rule in 2011. Still, that there’s some doubt about this “iron rule” of politics has deeper implications for our understanding of democratization, and “development” more generally. In American political science, at least, the prevailing view is that democracy is the best and final form of government attained by countries as they modernize and “mature,” politically and economically. This view seems to find confirmation in a world where democracies that have crossed some developmental threshold never fail. If democracy sometimes does fail even in richer countries, however, then the whole premise of modernity as the end stage of a process of growth and maturation becomes a bit muddled. The strong correlation between wealth and the survival of democracy is still there, but the inference from that correlation that modernity is a package deal looks a bit shakier. One thing that’s striking is that elections seem to be a self-institutionalizing mechanism. By this, I mean the following: that once a country holds one decent election, the probability that the democratic regime will be overthrown in the future declines rapidly. I can tell you, without an election is 1 in 8; after one election, 1 in 25; after two elections, 1 in 55; after three elections, 1 in 90. So that first decent election–and not even with alternation that was Sam Huntington’s criterion–just having an honest election in which there’s some competition and somebody wins, the winner occupies the office of government and runs an honest election again, that’s enough. Once again, that’s not the pattern I see. In the report I mentioned earlier–and blogged here in September–I find that the risk of backsliding actually increases over time until democracies are in their teens or even early 20s. In Przeworski’s terms, the pattern I see implies that democracies have to survive at least a few election cycles before their risk of breakdown starts to decline, other things being equal. At the same time, I also find that alternation in power does make a big difference; other things being equal, democracies that have seen at least one alternation of the party in power are less than half as likely to fail as ones that have not. Maybe this disagreement is, at least in part, an artifact of differences in the measures of democracy employed by our respective studies. Unsurprisingly, I happen to think my measure is more useful, but plenty of people use the version on which Przeworski’s assertion is based. Still, that we can’t be sure Przeworski’s pattern is real is a big deal, not the least because it suggests very different strategies for interested parties seeking to support the survival of democracy in cases that have recently established it. In Przeworski’s world, a strategically minded supporter might focus her efforts on the first one or two elections. In my world, that supporter pretty much needs to keep worrying until a democratic alternation in power occurs. If we’re not sure which of those worlds we inhabit but we care deeply about the survival of democracy, then we’ll probably want to err on the safe side and assume the risk persists much longer than Przeworski’s inference about elections as a “self-institutionalizing mechanism” would lead us to do. Identifying the causal effects of any kind of policy intervention is extremely tricky. Yes, in a world with no “control” group, a relatively small number of events, and a dense web of causes and interventions, it’s virtually impossible to say anything with confidence about the marginal effects of specific policies and programs on the prospects for democratic transitions and consolidation. Look at the United States from the point of view of Russians or the Chinese…It’s a country where half of the population doesn’t vote, even in presidential elections; where barriers of entry to politics are enormous; in which practices which in other countries would be considered political corruption are ubiquitous; a country with the highest degree of inequality among the developed countries; a country in which, at least for black American males, being free means only being out of jail; the oldest democracy in the world which has the highest rate of incarceration in the world. I think that, if democracy promotion is to be at all credible and at all effective, it should begin at home. A few days ago, Sean Langberg blogged about a subject that’s long been a pet peeve of mine: how we classify countries when we try to talk about the international system, and the labels we apply to the resulting groups. I thought I’d take the cue to air my grievances on the topic and make a couple of simple suggestions. This conventional approach is plainly displayed in the International Monetary Fund’s (IMF) semi-annual World Economic Outlook reports, which sort countries into two bins: “advanced” and “emerging and developing.” The former includes the U.S., Canada, Europe, Australia and New Zealand, and a smattering of richer Asian countries, while the latter is, simply, everyone else. What, exactly, distinguishes these two groups is left unspecified–according to the April 2012 report, “This classification is not based on strict criteria, economic or otherwise, and it has evolved over time”–but the basic divide is the familiar one between the “West” and “the rest.” The First World vs. Third World tags have largely faded from use since the Second World disappeared in the early 1990s, but the underlying concept is the same. What’s so distasteful about the conventional approach are its connotations of hierarchy and even moral superiority. A couple dozen countries, mostly “white” and European, are described as having reached the desired end state, while the rest of the world struggles and strains to catch up. The rich and powerful have matured; a few fortunate others are just now emerging from backwardness; and the rest remain retarded in their development. There are other ways to do this. Back when Marxism was still alive and kicking, some social scientists used it to divide the world into a “center” and a “periphery” defined by the economic exploitation and political subjugation of the latter by the former. Dubbed dependency theory, this scheme died a bitter death for empirical, political, and sociological reasons. Empirically, dependency theory couldn’t really explain how some once-peripheral countries eventually got much richer in spite of their supposed subjugation. Politically, the import-substitution policies dependency theorists prescribed were a bust. Sociologically, dependency theory got tagged (with justification) as part of a wider leftist political project, so it was further deflated by the ideological and practical collapse of Communism in the late 1980s. All of that said, dependency theory did present a reasoned alternative to the neoliberal scheme it opposed, and, in so doing, it spotlighted some important realities of the international system. Some have tried to classify countries along religious or cultural lines, but I think these attempts have generally been less successful. The most prominent expression of this approach in the U.S. comes from Samuel Huntington’s “clash of civilizations” writings, in which he argued that the fundamental sources of conflict between states in the post-Cold War world would be cultural rather than ideological or economic. This thesis seems to find some echoes in the Global War on Terror, but critics have rightfully taken Huntington to task for reducing the fantastic diversity and rapidly-evolving cultural constellations of so many countries to a single, simple identity defined primarily by their dominant religions. More generally, I wonder if the distinction between sacred and secular generally means that states aren’t the relevant units for global taxonomies based on religion. Perhaps clans, families, or souls would be more fitting. Ongoing attempts by some Muslims to establish a caliphate imply that it is at least theoretically possible to sort international political units into insider and outsider groups based on religious practice, but the fact that these groupings generally contain one or zero countries should tell us something about their disutility. For comparing countries, wealth seems like a perfectly good yardstick, in no small part because national wealth is so tightly linked to the forms of power that drive contemporary international relations. But then why not talk about money instead of this fuzzier idea of development? This is what the World Bank does nowadays, and its low-income, middle-income, and high-income designations–based strictly on gross national income (GNI) per capita–would seem to offer more analytical leverage than the IMF’s “developed” vs. “emerging” distinction without all the ugly baggage. The Economist takes this approach, too, and seems no worse for it. For people concerned about the broader package of liberal constructs–the values and institutional forms that most authors probably have in mind when they refer to the “West”–why not make those criteria explicit and be more transparent about how they are measured? Observers who are primarily interested in domestic politics might consider the organization of a country’s political economy to compare it with others. This could be done by considering procedures to select national leaders on the one hand and prevailing sources of wealth generation on the other. Meanwhile, people who are more interested in the organization of the international system could look explicitly at formal and informal entanglements among states to identify relevant communities in a way that escapes the tired and broken bifurcations of East vs. West and North vs. South. Whatever your preferred solution, I beg you, please, stop, stop, STOP referring to countries as “developed” and “developing.” And if you find that you must, at least put those awful labels in quotes. For the past 25 years, when we’ve talked about democratization, we’ve used the lexicon of transitions. As the prevailing narrative would have it, the breakdown of authoritarian rule launches a process of institution-building that leads eventually to democracy. Political democratization is the conjoined twin of social and economic modernization, and any country moving away from an authoritarian regime can usefully be described as “in transition” to a democratic one. In geological terms, the transitions approach likens democratization to the production of igneous rock. Over time, pressures build under the crust of an existing authoritarian order. When that pressure becomes too intense, an eruption occurs. The old order is shattered, and fresh material pours onto the surface. That fresh material gradually but inexorably cools and hardens into a new, more modern order. The process might take a while, and parts of the new formation might crack and crumble while young, but the basic process is one of unidirectional transformation through disruption, replacement, and consolidation. I don’t think the transitions metaphor works very well, and I’m not alone in that view. Ten years ago, Thomas Carothers wrote an essay called “The End of the Transitions Paradigm” that nicely showed how the transitions metaphor misrepresented the messier reality of modern regime change, and how that mismatch had often led Western foreign policy and aid astray. Carothers’ essay was read widely in professional circles, but it doesn’t seem to have produced the gestalt shift to which its title aspired. Twenty years after the Soviet Union disintegrated, we still talk about the states born of that collapse being “lost in transition.” One of the first things the U.S. Department of State did after the Arab Spring hit was to open a Middle East Transitions Office that could coordinate and oversee U.S. policy toward the three “transition countries” of Egypt, Tunisia, and Libya. In 2012, the U.S. Agency for International Development (USAID) still maintains an Office of Transition Initiatives that motivates its existence with a narrative of disruption, opportunity, and consolidation. I think the biggest problem with the transitions metaphor is that it misrepresents the nature of the underlying change process. Returning to the language of geology, I think democratization is more like the production of sedimentary rock than igneous. Institutions aren’t destroyed, replaced, and consolidated; as Francis Fukuyama masterfully describes in The Origins of Political Order, they are laid down in layers. New and old abut and sometimes comingle at the edges, but the one does not supplant the other. Instead, many layers coexist, and over time the process of layering interacts with other forces, like gravity and erosion, to produce something different from the sum of its parts. The heart of the process is not disruption but accretion. Change does not occur in a sequence; instead, it occurs through the interaction of multiple processes occurring on different time scales. We can see this kind of accretive process occurring in “transitional” countries like Egypt, where the dramatic changes that have followed Mubarak’s ouster–the establishment of a new ruling council, the emergence of new political parties, and the convocation of a freshly elected parliament–have been poured atop a political economy that does yet not seem to have cracked or shifted. We can see the interaction between layering and other forces in “consolidating” countries like Turkey, where the military’s role as political overseer wasn’t ended abruptly but instead shifted gradually as military elites became sandwiched between strengthening Islamist forces and the hardening expectations of its NATO allies. We can even see these complex and cumulative effects at work in authoritarian regimes like China’s, where traditional kinship groups are the organizational form through which some of the most powerful demands for democratization are being expressed. Those demands, in turn, are arising in response to land grabs driven by the interplay of newer forces of globalization and long-standing forms of elite privilege. Carothers’ 2002 essay might not have transformed the way we talk about democratization, but it’s not because he was wrong. Where the prevailing metaphor sees disruption and displacement, a closer look at the world suggests a more complex process of accumulation and gradual transformation. Maybe intellectual orders work like political ones, and the shift away from teleological metaphors of transition and consolidation will happen gradually and subtly. However it happens, it would be nice to see it happen soon.